With the growing business needs, a lot of configuration changes take place on a daily basis. Although, a network admin can carry out the changes manually, there is a high possibility that it might lead to errors, resulting in faulty configurations. A faulty configuration is easily prone to vulnerabilities which might even cause a network outage. Network Configuration Manager is specially designed to serve this purpose and helps to attain complete Network change and configuration management(NCCM). How to handle network outages with configuration backups? The first step to handle a network outage is to revert a configuration of a network device by uploading a backup configuration file. By doing so, you can reduce the recovery time of network devices when an outage happens. A backup also comes in handy to compare network configurations of multiple devices. Network Configuration Manager fulfills this by providing automated configuration backups. Backup configurations of device/device groups instantly with a single click. How to prevent data misuse with Role based access control (RBAC)? In a network environment consisting of thousands of devices and a huge number of network admins, it is hard to keep track of who makes the change. 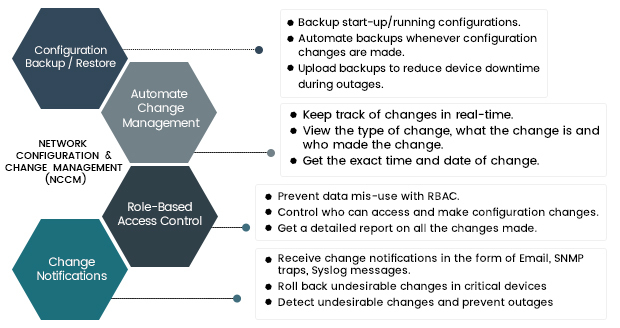 Network Configuration Manager provides an ideal solution for this through Role-Base Access Control (RBAC). Administrator - Permission to access all devices/make changes. Restricted admin(power user) - Permission to access specific network devices/make changes, he cannot add or delete other devices. Operator - He has limited permission to access devices and he should wait for the approval of power users or the admin to upload or make changes in the device. This gives the admin the leverage to control the changes in his network, making configuration and change management easily attainable. A report on all the changes made by different users can also be generated. How to track changes in network configurations? Change management is crucial in IT companies these days, as data changes are often made with the increasing business demands. It is challenging to manually track every change made in an organization as there are many network devices and configuration files. Network Configuration Manager helps to keep track of all the changes made in real-time with the help of change management. Get immediate notifications on who made the change. Get automated configuration back up after the changes are saved. How to get immediate notifications when a configuration change is made? While managing configurations, scrutinizing every change made in them is necessary. When a faulty configuration change goes unnoticed, it might lead to device downtime and might also affect network performance. This can be prevented by using the change notification option available in Network Configuration Manager. In vulnerable devices such as core routers or firewalls, you can roll back to a previous version or the baseline version if you detect undesirable changes.